Mangaluru, Oct 27, 2016: It is reported that Hindu organisations and activists opposed a move by MLC Ivan D’Souza, chief whip of the Congress in the state legislative Council, from organising the Bhavaikyata Diwali planned in Shree Kshetra Kadri on October 29. Their objection is over the MLC’s declared religion and the organisations feel that MLC Ivan’s entry in the temple will defile its sanctity. They contend that Hindu religious places are for Hindus. They, however, have no qualms about B Ramanath Rai, district in-charge minister, organising a similar event at the temple. It is also their contention that no non-Hindu can organise any religious programme in a Hindu temple managed by the endowment department. They cited the invitation case with former DC A B Ibrahim’s name on the invite and the HC’s orders. They feel organising such a programme will undermine the religious sanctity and traditions of the temple. 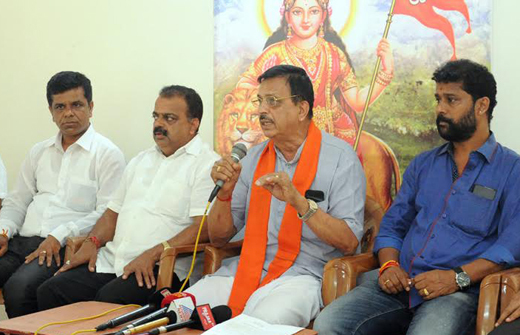 Laying down this diktat, M B Puranik, regional working president of VHP, Karnataka said since the Kadri Sri Manjunatha Temple comes under the endowment department, there is also no scope for any such politically motivated programme. "VHP and all Hindu organisations strongly condemn this move and have urged the district administration, police and endowment department to stop it. If he is so particular, let Ivan celebrate Diwali in a church or a mosque," Puranik said. Do not agree to VHP activists . No religion or God has told so .It is we who create inferiority toward other religion . Can you differentiate person by the colour of blood? The Hindu organisations are raising issues unnecessarily . National Integrity doesn’t have nay meaning in our country.